Alfresco Share 3.2 is shaping up to be a great development platform. Prior to 3.1, Share's access to standard Alfresco repository capabilities were disappointingly weak. But with the 3.2 release, many repository features have been migrated from the older Alfresco JSF client (aka the 'explorer' client) to the Share Document Library. Unfortunately, Alfresco's Advanced Workflow, the ability to create complex workflows using jBPM and to use them within Alfresco, is still not quite prime time. There's talk that Advanced Workflow will be ready to ship as part of the 3.3 release of Share. On the Alfresco wiki, a series of goals for implementing Advanced Workflow in Share are listed. But... the current state of Alfresco 3.2 Share makes it look like a full integration of Advanced Workflow with Share may not be that far off. 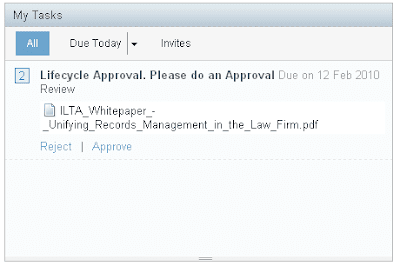 One promising sign is that two built-in Advanced Workflows already ship with Share 3.2: "Adhoc Tasks" and "Review and Approve". The negative is that only these two workflows are available -- and they are hardcoded. 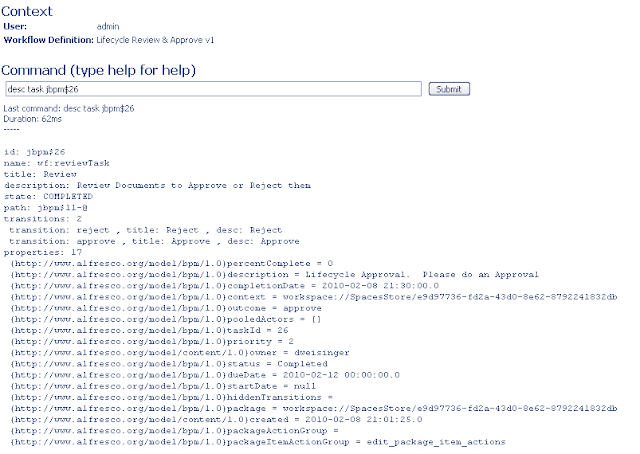 Also assigning a document to one of those workflows throws some errors at the server. We're anxious to see general Advanced Workflow working in Share, so I decided to investigate a bit to see what could be done to make a general workflow work in Share 3.2. With these files in place, the web application server can be restarted. 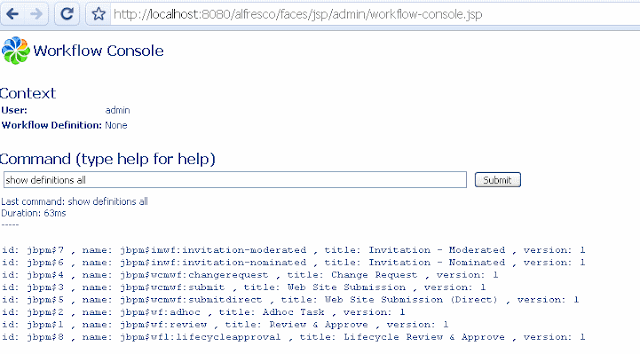 Then by going to the workflow console in the Alfresco repository application, you can see that the workflow has been defined. From the workflow console screen, you can check the status of the newly created instance of the workflow. 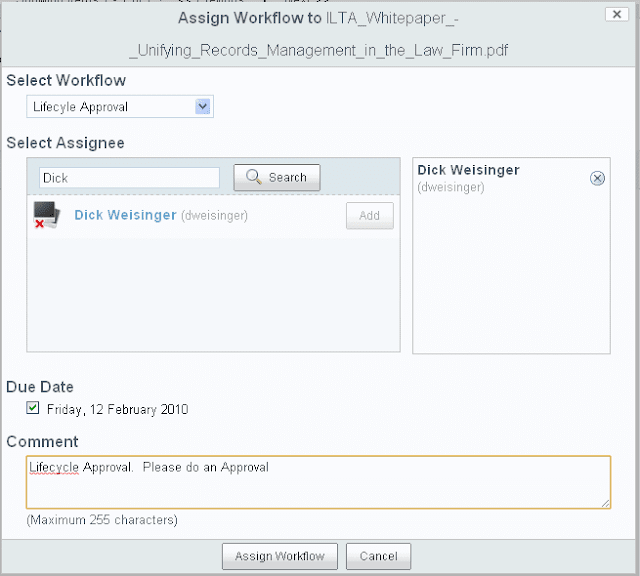 First, specify which workflow definition id you will be querying. And then query the workflow id of the current instance of the workflow. The workflow id of the workflow instance is jbpm$11. And the path id for this workflow instance is jbpm$11-@. So it looks like the workflow is working. But a glance at the tomcat console shows that there are errors being reported each time a workflow is assigned to a document. With a little bit of investigation, the problem can be traced to the file alfresco\tomcat\webapps\alfresco\WEB-INF\classes\alfresco\templates\webscripts\org\alfresco\slingshot\documentlibrary\action\assign-workflow.post.json.ftl. The variable 'results' is entering the Freemarker macro as undefined. I'm not sure how serious a problem this is, but making the following change to this file avoids the error. This test seems to indicate that while Workflow within Alfresco Share in the 3.2 release is not officially ready, it may be close enough for at least creating simple workflows like the one described here. what should we replace < with? < ? &lt? Is there a limit to the number of custom workflows that can be deployed? 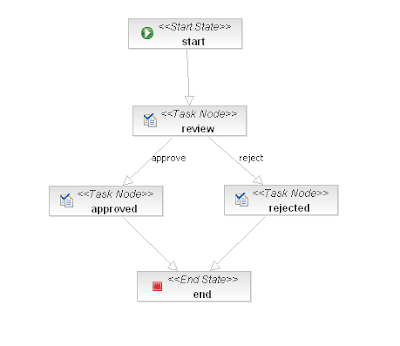 Alfresco recognized my first custom workflow, but not subsequent new workflows that were added in the same way. It should work with any number of workflows. I've tried with two and had no problem. Check in the WF console to see that your workflows are deployed and make sure you edit the Share workflow.get.html.ftl file to expose the workflows in Share. Better Share WF capabilities are planned for Alfresco 3.3. Thanks for this walk through. 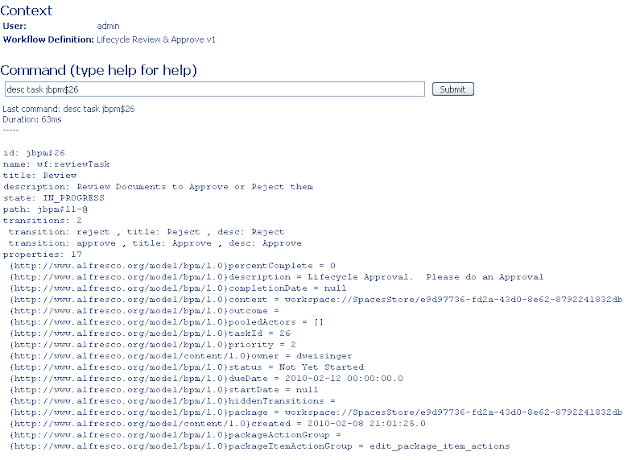 The bit I still find confusing is the replace '<' bit in lifecycle_processdefinition.xml. Should the code use "<" or "& l t ;" (sorry the html entity isn't allowed in comments). Advanced Workflow support isn't in v3.3 - sorry. I have moved the two workflow definitions out into share-config.xml though, so it should be easier to add your own. We've also fixed the "double submission" bug that caused the benign exception on the server (benign because it's the 2nd submission which causes the issue). The good news is that full Task and Workflow support for Share is in the process of being designed for "Project Swift" - the end-of-year release.